The boys had a great training day and took everything in their stride. Left to right are puppy walkers Lyn and Dave with TPD Ben and Chris and his son Jake with TPD Bill. 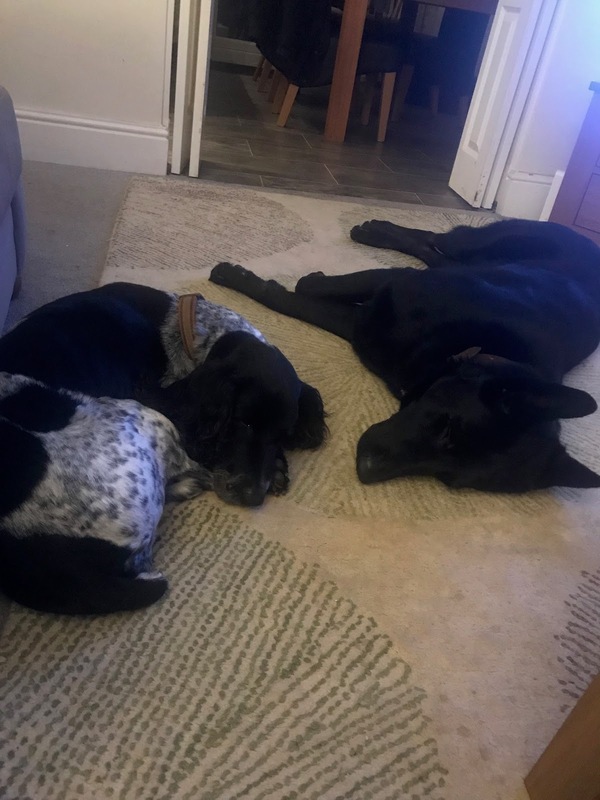 Bill and Ben were acquired from Lorokmor working kennels for our January 2019 Initial Police dog course. In addition to training Bill and Ben I also invited Elsa for an individual assessment which I will explain about later in the blog. They were both very confident on meeting Elsa for the first time and I thought Elsa demonstrated remarkable tolerance towards them. Their first training day included an introduction to tracking, the recall to handler, adopting the sit and downs positions, and negotiating agility obstacles. We started with the very early stages of getting the pup to recall to his/her handler at speed. For me this is probably the most important exercise for all dogs. Obviously the puppy walkers are practising play recall’s all the time at home for a titbit. At the class we start with one person holding the puppy on a non-tangle line and the puppy walker letting the puppy know that they have a toy or titbit. The puppy walker then runs backwards calling the puppies name in a high pitched voice and the word ‘come’ and crouching down as the puppy arrives to play or take the titbit. The pups will eventually do this alongside the other pups. Here is Ben practising his recall with Dave and Lyn. Next we did some sit and down work again using titbits. We then introduced the pups to the agility equipment which includes various ramps and a tunnel. We obviously can’t do proper agility with the pups because of growing joints but we can use various obstacles to build confidence and resilience. We then finished with an introduction to tracking. We do this exercise on every session because the vast majority of a Police dogs work involves following the trails of fleeing criminals and vulnerable missing persons. Most dogs from working backgrounds will instinctively follow the trails of animals or people. We school them to follow only the footsteps of people by initially placing titbits in every footstep of the tracklayer. As the dog becomes more proficient he/she makes the association that following footsteps is rewarding and the food is gradually phased out. The dog then tracks for his/her toy hidden on the track or for a person hidden at the end of the track. Next time we will introduce article searching. Elsa with her puppy walkers Steve and Maria. Here she is waiting patiently for her turn to track. It is unlikely that she will be required as the dogs on the course (which includes her brother Eric) all seem to be doing very well. I assessed her article searching, tracking and criminal work which were all exceptional for a dog of her age. Here she is demonstrating desire, focus and determination on her track. Her criminal work is very determined and confident. All of our dogs before going on an Initial Police dog course have to undergo several boldness tests to give us an idea how they will react to a threat or something unusual happening. We know that dogs are not fully mature until they are between 2 and 3 years of age and so we take into account their lack of maturity when we perform these tests. This is Rika one of our operational dogs performing one of these tests when she was 12 months old. She is running through the woods off lead when a flowerpot man fly’s into the air taking her by surprise. Some dogs run a mile and will not go near the flowerpot man after the shock. We have an area in Plymouth with various equipment where we perform these tests but today we were at HQ and so I had to improvise. So on this occasion I asked the puppy walker to walk into an area with his dog running free and most importantly not on a lead. I wanted to see her reaction to someone strange wearing a mask slowly emerging from some bushes. We know that most young dogs will take flight to give them time to evaluate the situation. 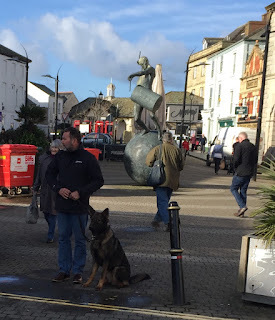 We are assessing whether the dog is able to regain its composure and whether it will join its handler who walks over to talk to the individual who then removes the mask. Elsa’s reaction was text book she didn’t take flight, stood her ground and backed her handler up. Knowing her as I do I wasn’t at all surprised. She is a very impressive female and a credit to her breeder. I have been so impressed with Elsa I believe she should be one of our breeding females for the future. Last week I collected Lulu and Lola from Lorokmor kennels in Shropshire for our January 2019 Initial Police dog course. 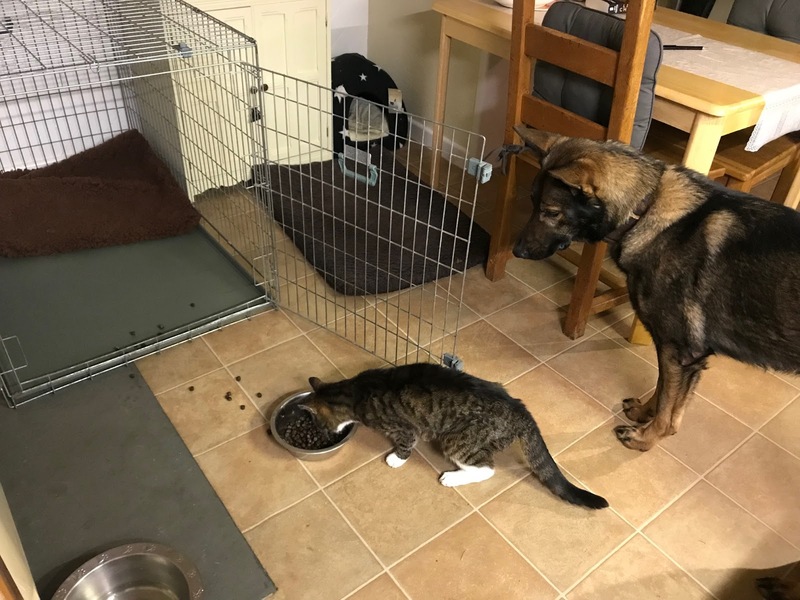 ( Lulu is the pup with her paws on the flowerpot )They will join Bill & Ben who were also acquired from Lorokmor for the Jan 2019 course. They were very quiet on the journey back to my house and immediately on arrival at our house they set of to explore the garden. They both slept well overnight and the following morning they continued to explore in a lovely crisp frost. I was interested to see how they would react to meeting my German shepherd Ella who I know is very good with pups. Lola was very confident but Lulu certainly wasn’t hanging around. This set the tone for the next few days with Lola very confident with every situation she met and Lula not so. Plymouth to meet their new puppy walkers. I already had a pretty good idea about their individual characters from their time with me but before allocating the pups my friend Graham Mabbutt a very experienced puppy assessor was keen to take a look at the pups. We let them have a run down on the lawn at his house to spend a penny and it was interesting watching them explore where the ducks congregate by the river. 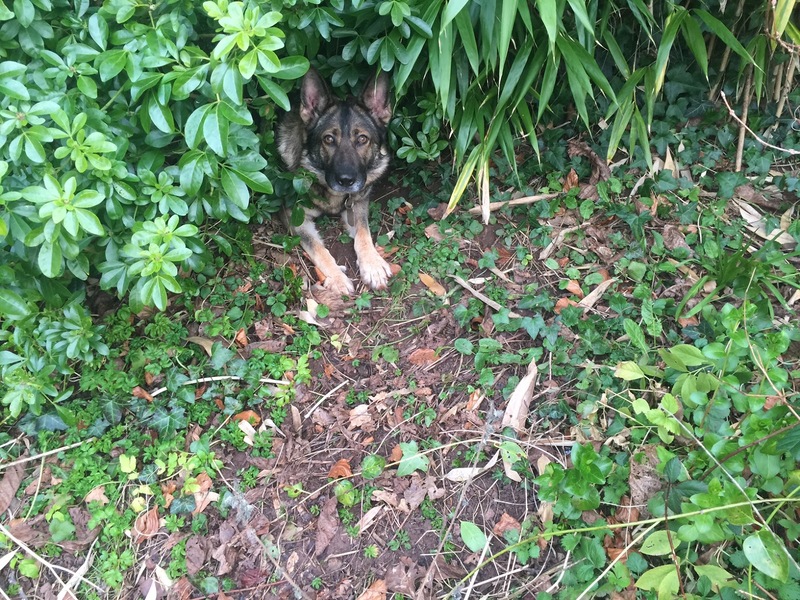 Lola assessed as a very confident, playful, determined and calm puppy giving every indication she will be a very good working Police dog. I find it quite incredible that 86 year old Graham still has such a burning passion for dogs. In this picture he hasn’t collapsed he just likes to put the pup at ease to give her/him every chance to relax and demonstrate his/her working aptitude. Lulu assessed as a very happy busy delightful little puppy but she lacked the determination, confidence and steel exhibited by her sister Lola. I have no doubt she will become much more confident with time but she definitely has a cautious nature and will avoid situations she is unsure of. Karol with his sister Christina, mum Anna and dad Steve. The next stop was to allocate Lulu to Margaret. Lulu is seen here with Margaret and her grandchildren Erin and Ellis. Erin and Ellis couldn’t resist having their own cuddle with little Lulu. Both pups have settled well into their new homes. I visited both pups on Wednesday this week to see how they were getting on. Here is little Lola in the garden looking for her reward having just spent a penny. Karol and his family told me that Lola has really settled in and doesn’t seem afraid of anything. It was obvious watching her that she is just as she was on the assessment. Very forward, confident playful and very determined. She is also very independent not interested in cuddles or fuss. She was completely unfazed by the hoover. My visit was quite short lived because Lola had to go for a follow up vets appointment because she is drinking excessive amounts of water. We are awaiting blood and urine test results. I was amazed at the way she swaggered down the road to the car as if she owned the neighbourhood. Next I popped in to see Lulu and Margaret. I really like Lulu’s happy little character; she is such a friendly people orientated puppy. She is a very alert dog with high energy levels. But I did witness further evidence of her cautious nature particularly when she heard the hoover switched on from a distance. 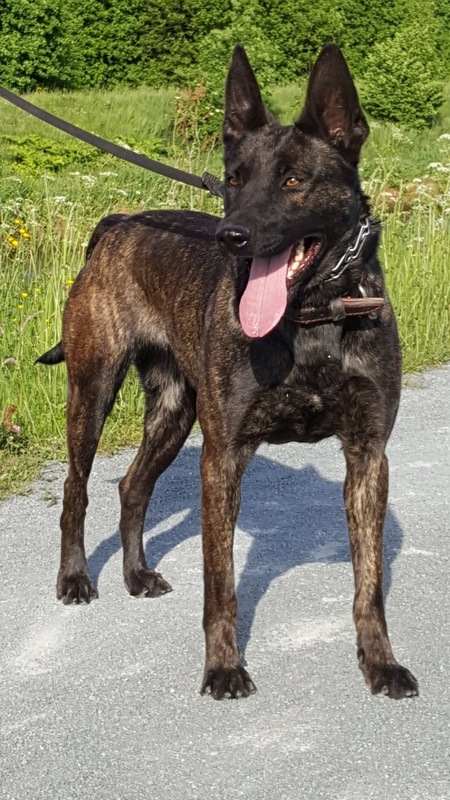 Her cautious nature and inability to forget an unpleasant experience causes me to question whether she has the type of character needed to be a General purpose Police dog. I think she will be a delightful dog to own and will be a very active dog who will need an outlet for her energy such as dog trials or dog sport. Lulu eventually crashed out in the kitchen and so I took the opportunity to make my exit. It will be very interesting to see how they both develop. 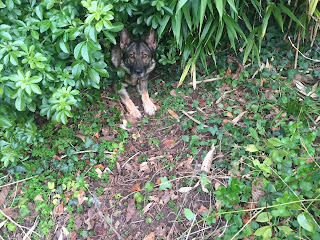 Sasha has started all the signs of her imminent whelping as she regularly visits her likely den’s in and around the garden. I have to make sure I do not leave the van door open because once she gets in there she won’t come out. She obviously thinks I might take her to work. She insists on her daily walks to the orchard at Killerton. We don’t think she is having many pups as only two were seen on the scan. The main thing is that mother and pups are healthy and well. I will leave you with Sasha relaxing in the sun today giving her pups an early blast of sunshine. Sasha does tolerate my female Ella but I have to exercise them separately because I can see that Sasha is nervous of Ella who whizzes around everywhere and could accidently bump into her. Next time I hope to have some good news to tell you about Sasha and a report on our visit to the farm on Sunday for Merlin, Henry, Quini, Quest and Peppe. From Sasha and Ella bye for now. The course started on the 5 of Feb with Ollie, Tag and Roscoe. ( Oscar) Those dogs have now completed 2 weeks of the 13 week course. 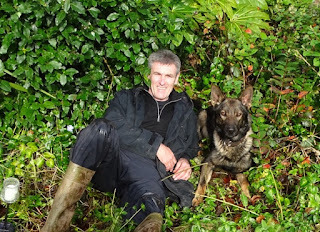 Eric was drafted in at short notice at the start of week 2 with new handler Pete. This was because of an existing handler retiring from the section earlier than planned. Here is an introduction to the individual teams. Dan has been a Devon and Cornwall Police officer for 15 years and lives in Plymouth with his wife and 2 children aged 6 and 8. They also have a 9 year old pet springer called Rockey. Dan tells me that Rocky is definitely the boss but they both get on well together. Dan has been actively trying to get onto the dog section for 6 years. Ollie was puppy walked by Paul and Debbie Burring. Ollie has two brothers Ozzie and Oscar ( Now Roscoe ) who were bred and supplied to us as eight week old puppies by my friend Richard Evans in Chesterfield. Oscar ( Now Roscoe ) is also on this course and Ozzie passed out on our previous course in December 2017. Here are the 3 boys being handed over to me by Richard and his wife Sue in January 2017. Steve lives in Yeovil with his wife and 3 children aged 7, 10 and 16 together with their 2 dogs Copper a Springer spaniel aged 2 and Gunnar a Pointer aged 6. He has been a Police officer in Dorset for 13 years and has been actively trying to get onto the dog section for 4 years. He started the September 2017 Police dog course with TPD Rudy but injured his knee and had to start all over again on this course with new dog Tag. Tag was puppy walked by Jo and Gideon Pritchard. They are pictured here with Tag and daughter Marina on one of the many training days they attended. 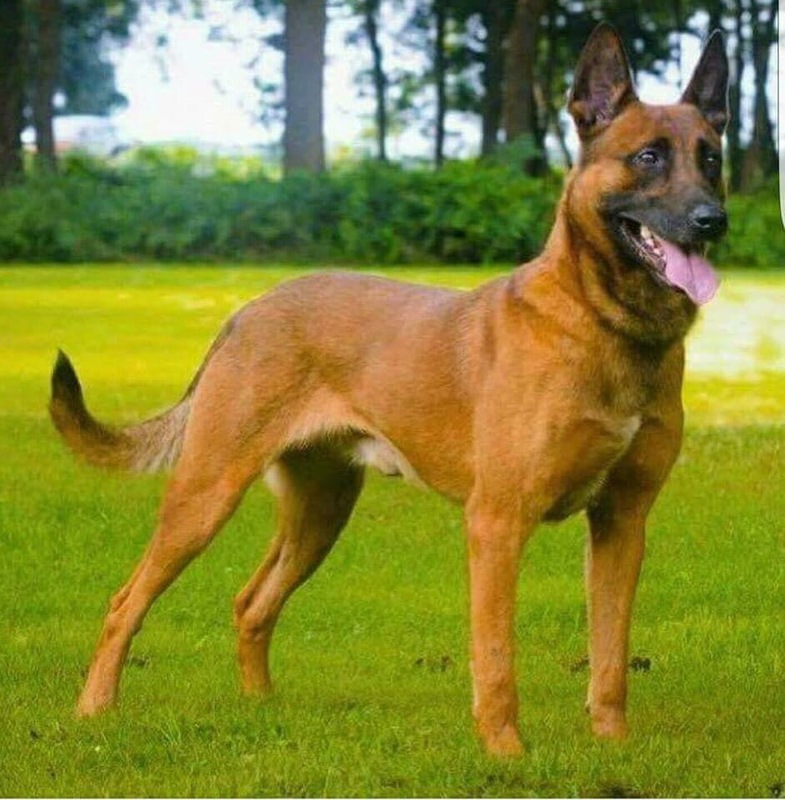 Tag was bred by Alfons Schumeister a breeder in Germany. We have 2 other operational Police dogs from his breeding Qwendi and Ronnie working in our Alliance. 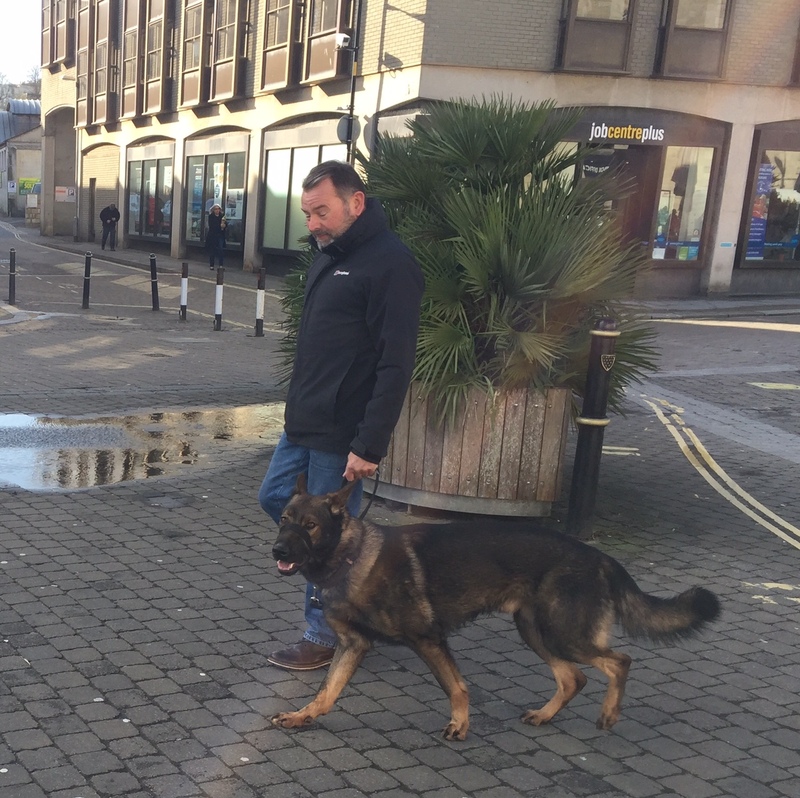 Pete had been a Police officer for 9 years in Devon and Cornwall and lives in Cornwall with his partner and 2 children aged 9 and 11. They also have a 7 year old German Shepherd called Demi. Pete has been actively trying to get onto the dog section for 4 years. His dog Eric was not due to start a Police course until September and was called up when a vacancy unexpectedly came up on the course for Pete. Eric will be 12 months old on the 4th March and so we need to manage him carefully. This means avoiding high impact exercises such as agility and being very careful not to push him into confrontational situations operationally until he is more mentally mature. He was Initially puppy walked by Terri and Mark Boswell until he became too strong for Terri . He was then puppy walked by retired Police dog handler Eamon Rogers and his wife Karen. 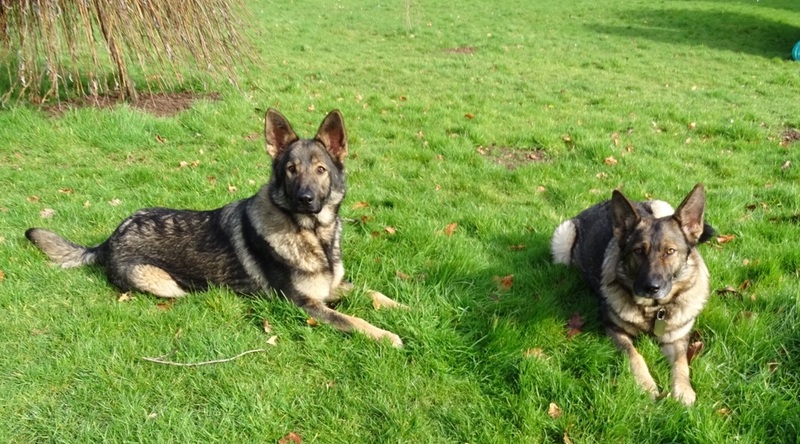 Eric is pictured here with his sister Elsa on one of their training days. Elsa has been puppy walked by Steve and Maria Pearce. Eric and Elsa were bred by Bernard Horton of Kazzardsway German shepherds in Manchester. I have been very impressed with Eric and Elsa and we are hoping to have further pups from Bernard in the April/ May time. 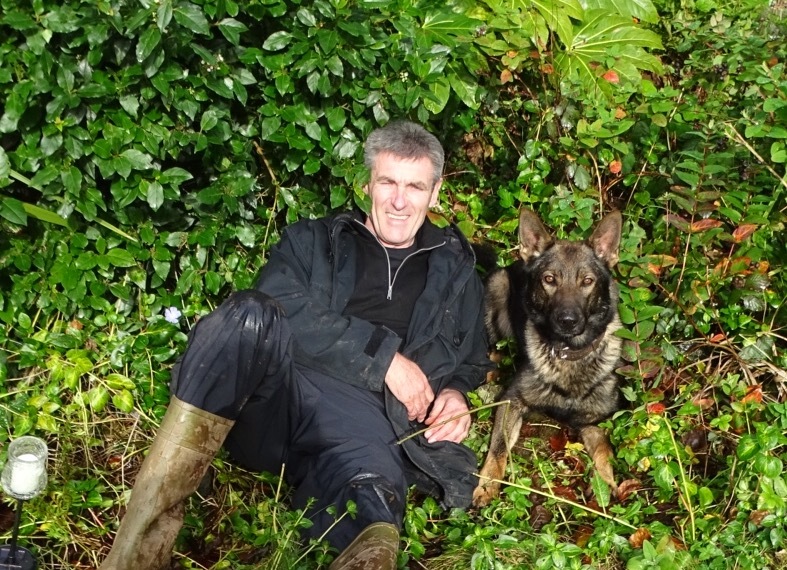 Mark has been a Police officer for 18 years and lives in St Austell with his wife and 2 children aged 11 and 18. They also currently have retired drugs dog Jack aged 10. 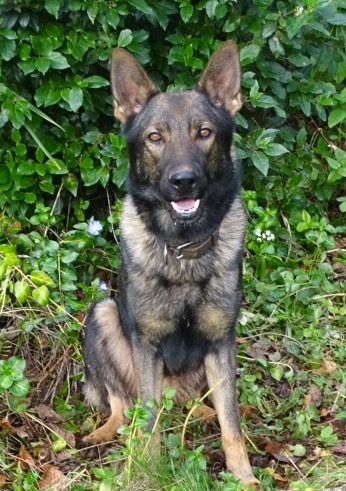 Roscoe ( Oscar ) will be Mark’s third General purpose Police dog. 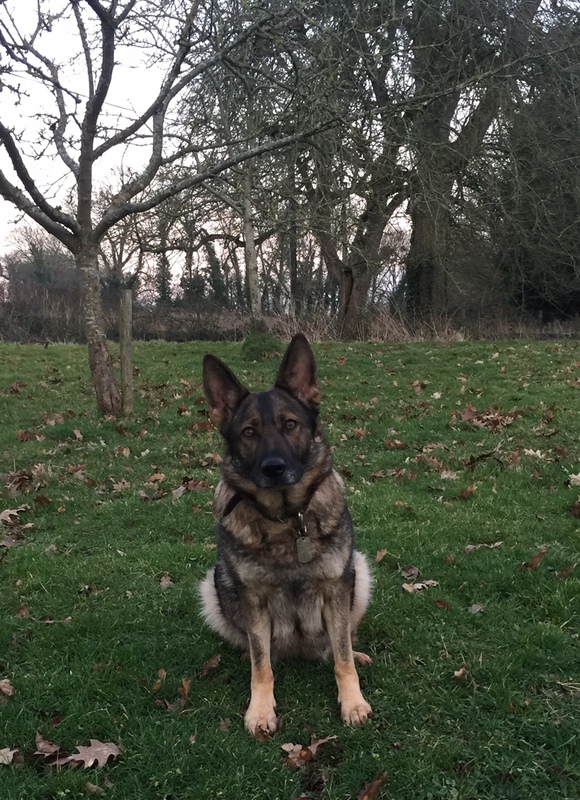 Mark wasn’t expecting to be on this course but sadly his much adored and successful Police dog Bess died unexpectedly just before Xmas with what was believed to be some sort of blood infection aged 7. Roscoe ( previously Oscar ) was puppy walked by Rebecca and Pete Bell. Up until December last year we only had 1 dog team on the course. That changed dramatically after a number of unforeseen circumstances arose and we now have 4 teams on the course. Once again this demonstrates the value of our puppy program in being able to supply dogs to our officers often at short notice. All 4 dogs have settled into the course and although it is early days they are all progressing very well. Here is Tag tracking across country with handler Steve. The 13 week General purpose Police dog course is without doubt the most intensive and multi skilled Police dog course that there is. Here is Mark and Roscoe ( Oscar ) in the early stages of training the long jump. During the 13 weeks the teams will be trained to deal with a wide range of disciplines and skills. This will include dealing with disorderly crowds, violent criminals, tracking and searching for outstanding offenders and vulnerable missing persons, searching for discarded or hidden articles, and negotiating different types of obstacles. This will all be underpinned by discipline and control exercises such as emergency recalls, heelwork, stay exercises and focus work. This work is very important in the early weeks. Here are some photos of the teams in action. Eric may be a week behind the rest of the boys but as you can see on his first tracking session that a lack of enthusiasm will not be a problem. Here are the handlers relaxing with their dogs while they wait for their turn on the agility circuit. The criminal work is still in the early stages but they all love this exercise. We tend to do this exercise at the end of the day to give them all a lift and they finish on a positive. Here is Tag on one of his early pad sessions. I will be reporting on the course again at 7 weeks to show you how they have all progressed. There was a huge response to our appeal for a forever home for Danno. I eventually narrowed it down to 10 excellent potential homes and I visited them all over a 2 week period with Danno. It was an excellent opportunity for me to see how Danno would react to meeting new situations and different people. He was absolutely flawless in the way he behaved. I have really enjoyed having Danno for the last 3 months but he needed his own home. I finally decided to place him with PCSO Kevin Youngman who lives in Cornwall with his wife Kerry and 2 elderly cats. 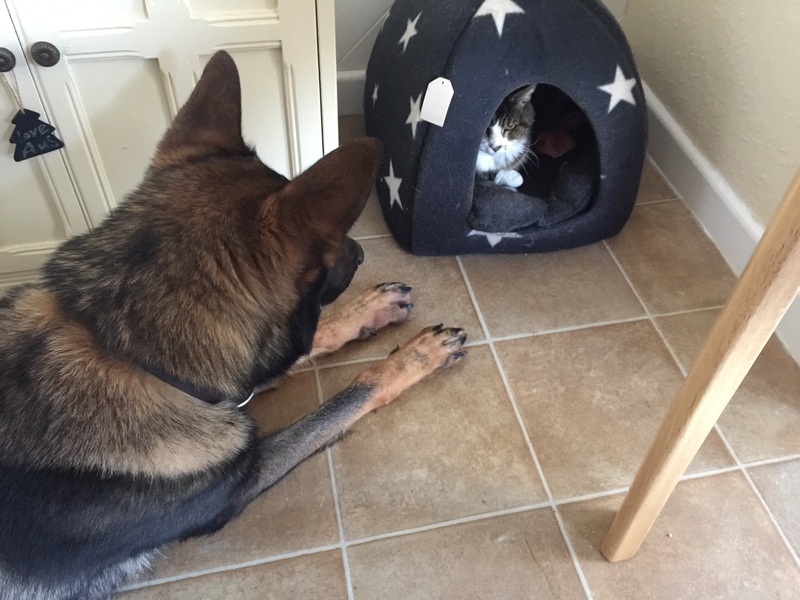 On our visit he was very well behaved towards Kevin’s 19 year old cat called Mars. I spent a couple of days instructing Kevin on how to walk Danno in urban areas and also how to take him on rural walks including games he enjoys and how to get him to ignore other dogs. Kevin’s wife hasn’t yet met Danno because she is in Australia meeting relatives and returns in two weeks time. Kevin is enjoying having Danno and can’t wait for his wife to meet him. So for now it is just Kevin and Danno. I knew that Danno was a gentleman and Kevin soon found that out when 19 year old Mars jumped in and started eating Danno’s lunch with Danno standing back to let him. In my next blog later this week I will introduce our new arrivals Lulu and Lola and I will show you how Bill and Ben got on in their first training session. I will also give you an update on Sasha whose puppies are due on or around Tuesday 27th Feb.
From Sasha, Ella and Me bye for now.